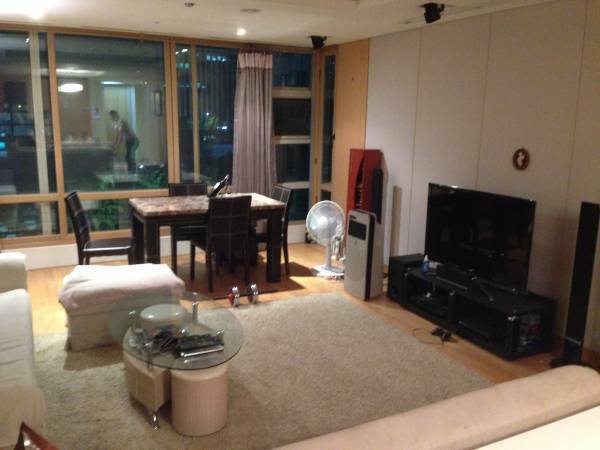 3 bedroom & 2 bathroom luxury apartment in a beautiful modern high rise apartment building located in Yeoido. The apartment, Lotte Castle Empire, has a huge gym (included in the utility fees) sauna and golf facilities (see 2 video tours below). There are 2 professionals living here (British and South African). Available December 1st. Our roommate is moving back to America. Utilities are equally divided every month. All utilities & energy bills will total between 120,000-150,000won per month. 2 minutes from Yeoido station (line 5 & 9) to the center of Gangnam (Sin-nonhyeon) 15 minutes & Samseong/COEX 20 minutes by express subway. 10 minutes away from both Hongdae and Itaewon.